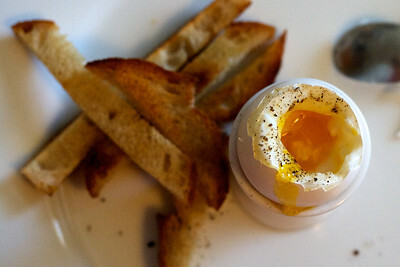 Soft boil couple of eggs, preferably from organically fed and farm raised hens. Cut up two slices of fresh sourdough bread into thick cut french fry style pieces. Heat a tablespoon of olive oil on a pan and saute these bread slices until golden and crackle-y. Crack open the top of your soft boiled egg, add some fleur de sel and freshly ground black pepper, dip the fried bread sticks in the yolk and enjoy. Cup of espresso at the end with a slice of pannetoni is nice but not absolutely essential for a great start to the day.